Prince of Wales (kiri depan) dan Repulse (kiri belakang) di bawah serangan oleh pesawat Jepang. Penenggelaman Prince of Wales dan Repulse adalah sebuah pertempuran angkatan laut Perang Dunia Kedua yang terjadi di utara Singapura, lepas pesisir timur Malaya, dekat Kuantan, Pahang, dimana kapal tempur Angkatan Laut Kerajaan Inggris HMS Prince of Wales dan kapal jelajah tempur HMS Repulse ditenggelamkan oleh pengebom dan pengebom torpedo yang berbasis di darat dari Angkatan Laut Kekaisaran Jepang pada 10 Desember 1941. Di Jepang, pertempuran tersebut disebut sebagai Pertempuran Angkatan Laut lepas Malaya (マレー沖海戦, Marē-oki kaisen). ^ Stephen, Martin. Sea Battles in Close-up: World War 2 (Shepperton, Surrey: Ian Allan, 1988), Volume 1, p. 111. ^ 3 pesawat ditembak jatuh dalam serangan tersebut, 1 crash-landed later, dan 2 pesawat scout gagal kembali dari misi mereka. Jack Greene, War at Sea, Pearl Harbor to Midway, 1988. (The Malayan Campaign). Combined Books. ISBN 0-8317-1257-0. Horodyski, Joseph M. "British Gamble in Asian Waters." Military Heritage. December 2001. Volume 3, No. 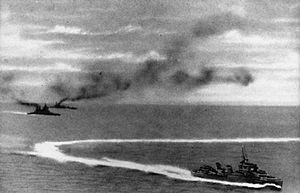 3: 68–77 (sinking of the British battleship Prince of Wales and battlecruiser Repulse by Japanese on 10 December 1941 upon US entry into World War II). Richard Hough, The Hunting of Force Z: the brief, controversial life of the modern battleship and its tragic close with the destruction of the "Prince of Wales" and "Repulse". Stephen, Martin. Sea Battles in Close-up, p. 99–114. Shepperton, Surrey: Ian Allan, 1988. Alan Matthews, Sailors' Tales: Life Onboard HMS Repulse During World War Two ISBN 0-9531217-0-4. Martin Middlebrook and Patrick Mahoney, Battleship: The Sinking of the Prince of Wales and the Repulse. New York: Charles Scribner's Sons, 1979. Contains details of the attack and damage sustained, and tables of survivors and losses. Samuel Eliot Morison, History of United States Naval Operations in World War II, Volume III, "The Rising Sun in the Pacific". V. E. Tarrant, King George V class Battleships, Arms and Armour Press, 1991, ISBN 1-85409-524-2. William Garzke and Robert Dulin, Battleships. Allied Battleships in World War II. United States Naval Institute. 1980. ISBN 0-87021-100-5. Detailed analysis of the sinking using the data available at the time. Arthur Nicholoson. Hostages to Fortune. Sutton Publishing. 2005 ISBN 0-7509-3948-6. Survey report compiled after Expedition 'Job 74', May 2007. Death of A Battleship: A Re-analysis of the Tragic Loss of HMS Prince of Wales. William Garzke, Robert Dulin, Kevin Denlay and members of the Society of Naval Architects and Marine Engineers Marine Forensic Committee. A post 2007 marine forensics analysis of the loss of HMS Prince of Wales taking all of the most recent information into account. Paul S. Dull, A battle history of the Imperial Japanese Navy, 1941–1945, Naval Institute Press, 2007. ISBN 978-1-59114-219-5. Frank Owen, The Fall of Singapore, Penguin Books, 2001, ISBN 0-14-139133-2. Wikimedia Commons memiliki media mengenai Penenggelaman Prince of Wales dan Repulse.